MELVILLE, N.Y., September 4, 2013 -– Canon U.S.A., Inc., a leader in digital imaging solutions, has announced today the new CN-E35mm T1.5 L F single-focal-length Cinema prime lens designed for large-format single-sensor digital cinematography cameras employing Super 35mm or full-frame 35mm imagers. 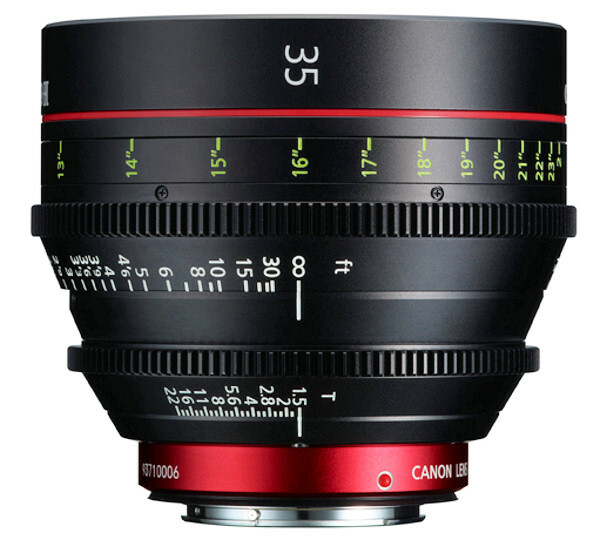 Delivering outstanding optical performance in contemporary 4K / 2K / HD motion imaging, the new Canon CN-E35mm T1.5 L F prime lens is the sixth member of Canon’s line of compact, precision-matched EF-mount Cinema prime lenses, which also includes 14mm, 24mm, 50mm, 85mm and 135mm EF-mount models. Collectively, Canon’s Cinema prime lens family delivers a wide range of the most important choices in focal lengths to address a myriad of creative digital cinematography choices. All six Canon Cinema prime lenses provide a full-frame 36mm x 24mm image circle for full compatibility with the Canon EOS-1D C, EOS C500, EOS C300 Digital Cinema cameras, the EOS 5D Mark III and EOS-1D X DSLR cameras, the EOS C100 Digital Video Camera and EF-mount cameras made by other manufacturers. The lenses also feature consistent color balance, minimal focus breathing, water-resistant rubber gaskets, and an 11-blade aperture diaphragm to help achieve creative depth-of-field manipulation and pleasing “bokeh” effects. The six Canon Cinema prime lenses are also designed to facilitate production with uniform stepless gear-positioning rings for iris and focus, with an identical 300º smooth rotation angle on the focus ring. These control rings – switchable from feet to metric labeling – maintain just the right amount of resistance with consistent operating torque. Lens barrels are engraved with easy-to-read scale markings, and consistent 114mm front lens diameters can accommodate screw-on filters and other accessories. Weight 2.65 lbs. 2.65 lbs. 2.43 lbs. 2.42 lbs. 2.87 lbs. 3.09 lbs. 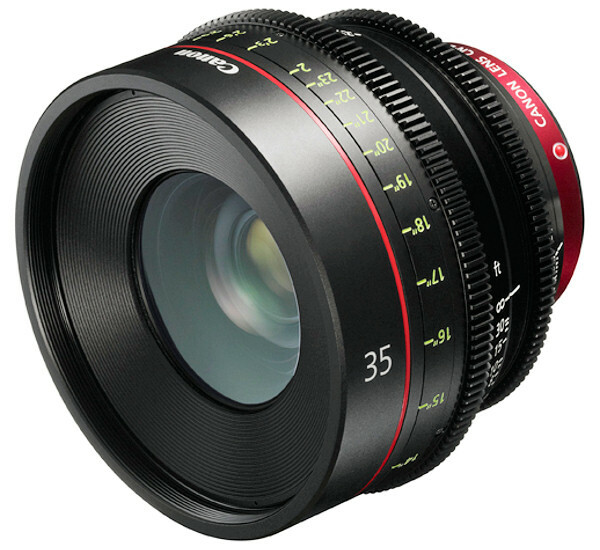 The Canon CN-E35mm T1.5 L F Cinema prime lens is expected to be available in December 2013 for an estimated retail price of $5,200. For a visual representation of the power of Canon’s Cinema optics, please visit: pro.usa.canon.com/cineoptics. Canon U.S.A., Inc., is a leading provider of consumer, business-to-business, and industrial digital imaging solutions. With approximately $40 billion in global revenue, its parent company, Canon Inc. (NYSE:CAJ), ranks third overall in U.S. patents registered in 2012† and is one of Fortune Magazine’s World’s Most Admired Companies in 2013. In 2012, Canon U.S.A. has received the PCMag.com Readers’ Choice Award for Service and Reliability in the digital camera and printer categories for the ninth consecutive year, and for camcorders for the past two years. Canon U.S.A. is committed to the highest level of customer satisfaction and loyalty, providing 100 percent U.S.-based consumer service and support for all of the products it distributes. Canon U.S.A. is dedicated to its Kyosei philosophy of social and environmental responsibility.